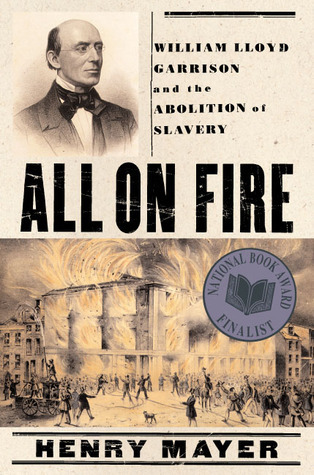 Reading National Book Award finalist "All on Fire," Henry Mayer's fine biography of abolitionist William Lloyd Garrison, makes me want to do something with my life. Find a cause. Agitate. Repeat.Garrison's role in the abolition of slavery was a prominent one but, Mayer asserts, is underappreciated today. This mild, personable man from humble beginnings pledged himself to abolition at age 24, eventually editing his own antislavery newspaper, The Liberator, that he would publish for 35 years — lasting through the end of slavery he had so long sought — and more than 1,800 issues. Mayer spends a great deal of time on Garrison's tempestuous early days, when he spoke, wrote and published at great physical risk. He thrillingly escapes from a mob, is jailed, is reviled in the South (of course) but also around Boston, where he did most of his great work. To a staunch defender of slavery, South Carolina's John C. Calhoun, he was a dangerous man who wouldn't shut his trap. Garrison was astonishing in his ceaseless agitation and singlemindedness. Surely, many in New England and around the world — Garrison made several trips to England — welcomed and supported him, and Garrison was far from a lone voice in the wilderness. But that voice called many important people to action. Mayer's contention is that Garrison's unbending zealotry today clouds people's minds as to what an influence he really had.Mayer relates that Garrison's relationship with the world's most famous ex-slave, Frederick Douglas, was a close one for a time but would grow frosty as the Civil War neared, with the bond breaking between the two pre-eminent spokesmen of radical abolition in 1847. Many of the women who would become leading lights in the women's suffrage movement started out as antislavery agitators, and Mayer writes in detail about how Garrison's unusual insistence on involving women in the abolitionist cause (allowing them to attend meetings! Make speeches! Horrors!) created great friction and resistance even among other antislavery people. In fact, the schisms created between people who generally were on the same side takes up big chunks of Mayer's book. Early on, it's the backers of immediatism like Garrison battling colonizationists, who oppose slavery but think they would be doing blacks (and themselves) a favor by sending them back to Africa. Garrison had no patience for such backdoor racism, nor for gradualists who saw slavery as a bane whose elimination could wait for a better time. I wasn't aware of Garrison's "nonresistance" stance, in which he essentially refused to politicize abolition, choosing not to vote at all or compromise his values for minor gains or political expediency. Interestingly, his willingness to do just that during the Civil War led to further splits with the abolitionists who thought the balding firebrand had gone soft. Garrison was understandably skeptical about Abraham Lincoln's resolve (Lincoln himself was a backer of colonization) in ending the great sin, but as Lincoln gradually came around, Garrison was there to embrace the change.Mayer's biography of Garrison touches on the slavery clash as the main cause of the Civil War, of course, from the 3/5 compromise that gave the South a disproportionate representation that helped keep slavery going, to the push-pull of the carving of the ever-expanding U.S. territory and whether the new states would become slave or free.Mayer presents too few extensive passages from The Liberator to suit me. He does quote from the publication, but I would have preferred more of Garrison's direct words from the newspaper into which he poured his soul for so long. That said, "All on Fire" is a very long work; 626 packed pages of text that, while readable, is not for quickie mainstream consumption. So it does go on a bit. But that only means we're in it for the long haul, just like Garrison; at journey's end is the satisfaction of doing right. This is another case of a book deserving five stars for accomplishing everything it could possibly really do. If you power through all 630 pages of this, there will be no need for you to ever read a book specifically about William Lloyd Garrison ever again. You will have covered the man, thoroughly. And it reads well too- this isn't a history book, really, it's a biography and written for a general audience, so Mayer takes a certain literary license in his storytelling. It was a welcome change for me, since academic history books aren't usually written to pull at the heartstrings, exactly...I admit, I got a little misty eyed at certain parts of this book. Where you'd expect, you know, Frederick Douglass standing up for the first time to tell his story at a meeting led by Garrison on Nantucket, the march of the 54th Massachusetts down to the docks to join the fight, Garrison meeting freed slaves in Charleston right after the war ended. It also was really fascinating to me how modern Garrison and his friends seemed. They were talking about human rights, civil rights for all, way back when. They were freedom riding around Massachusetts in the 1840s, trying to integrate public transit. Pretty impressive. There were still some issues I was a little confused about at the end of the book (for example, if Garrison didn't want to have anything to do with politics, then how exactly did he think slavery was actually going to get abolished, anyway? Did he think millions of people would just have a simultaneous change of heart?) but I don't think my confusion was the fault of the book, I think Garrison was just somewhat inexplicable sometimes. People are funny. Even in a 600 page biography, you aren't ever going to be able to explain a person completely. Also, to be fair, this is not a history of the abolition movement. It is a biography of Garrison. There are a lot of other facets of abolitionism that are not covered here because there was so much of Garrison. Reading history like this makes me proud to be a Mainer/Massachusettsite (they were the same state until 1820 after all). The book deserves five stars for its scholarship, fine writing, and importance of its subject, William Lloyd Garrison, who started an antislavery newspaper, The Liberator, when almost nobody thought slavery should be abolished. Garrison considered slavery to be evil, and he wanted slavery abolished immediately, rather than gradually. This ideal led him to be called a radical, and even people in favour of abolition considered him to be too extreme. He had no patience for those who, even if they knew slavery was wrong, still thought slavery should be maintained for political expediency. By the end of his life, Garrison was a witness to Abraham Lincoln's Emancipation Proclamation and the passage of the Thirteen Amendment.The book is especially good at documenting Garrison's early career, when he and his few supporters faced mob attacks at his speaking engagements, and when few established churches or politicians gave Garrison and radical abolitionists support. The book aims to restore Garrison's reputation, which has been damaged by criticism that he was an egotist who wanted to destroy America's institutions. Indeed, he did want to destroy America: he wanted to destroy a nation that allowed slavery to continue. He wanted a new America that treated all people as equal, as the Declaration of Independence claimed.The United States needs someone like Garrison to agitate for the revocation of the Second Amendment. This is quite a tome but well written and moves fast. If anybody should believe that standing up for something is pointless but still feels compelled to do so than this book is a must read. Garrison was a man who stuck to a single point: immediate, unqualifed abolition of slavery. He faced abuse, was lassoed and almost linched. The abolition movement was always there but, until Garrison came along, it existed beneath the surface and was considered too emotional and volatile an issue to address. He brought it to the surface. He started out in near poverty circumstances but his belief carried him forward.There were those who felt as he felt but when he started the Liberator his rhetoric and editorials inflamed public opinion and made people uncomfortable with their lukewarm feelings about it.Garrison made northerners feel guilty about their temporizing with slavery. People could no longer simply wish slavery to go away. They were forced to talk about it. They were forced to accept or deny it. Complacency over such a visceral issue was no longer allowed. In so doing, over a span of thirty years, Garrison took the issue of slavery from a topic one did not talk about in polite society to one where everybody began talking about it and began taking sides.It was a cause. It was a fight. It was ongoing and Garrison never flagged in agitating for his fellow man. He agitated for his fellow woman. When most other men thought that women should take a backseat in politics and momentous issues he supported the first real suffragettes in America. Where slavery was concerned, he would not let it die or go away. He was virtually alone when he began but, by the time he died, he counted many among his friends and many among the converted. Incredible. Do I love Garrison himself or is it this book that I love. The detail is tremendous so that you learn a great deal about the period. In many ways the history of Garrison is the history of the antislavery movement in America. So from 1830 to maybe 1850 the book is completely authoritative. As the movement grows and other major figures come into it like Wendell Phillips there are some things the books has too gloss over and you want even more. That there could be people more principled than Garrison in the 1860s and causing faction fights in the society to the left of him is fascinating. Maybe we need another book on that. But, to see one person's principled struggle over 40 years have the dramatic payoff that it did, without him ever compromising with the party system, the churches, sexists... is magnificent. Maybe I want to believe too much and someone will write a book that points out compromises with the racist slave power system that Garrison made but for now this book establishes him as possibly the greatest true American hero. This is a well-written biography about an important, underrated figure in US history. Garrison edited The Liberator for 30 years, spoke all over the country and in England, and agitated against slavery. He criticized the U.S. Constitution for protecting that evil institution; at one 4th of July event, he burned a copy of the Fugitive Slave Law and the Constitution. Garrison also supported the inclusion of women in anti-slavery meetings and their equal rights, including the right to vote. He bravely criticized churches and ministers who waffled on the slavery issue, and despite his deep faith in the God of justice and love, he stopped attending church, seeing it as a flawed, hypocritical institution. God's work was not confined to a stuffy, self-congratulating Sunday service. Mayer rightly equates Garrison's work to that of Thoreau, Gandhi, and Martin Luther King, Jr. This is a biography that will inspire you, enrage you, and engage your mind, heart, and spirit. Garrison was one of the true great American heroes. And this is a great biography of him. He was a pacifist and egalitarian who basically started the abolition movement in the early 1830's when the only anti-slavery people were re-colonialists (a movement he helped discredit) and a few scattered Quakers. While some Free-Soilers were somewhat racist and other anti-slavery leaders tried to keep woman from speaking out, Garrison stood firm on woman's rights and supporting full civil rights for newly freed slaves. As this book shows, a movement requires radicals agitating from the outside as well as moderates working within the system to make change. Speaking as an atheist, William Lloyd Garrison is the kind of religious fanatic I can get behind. Amazing! After reading such a great book as this about a life lived so purposely, it's really challenging for me decide what to read next. Once, the book quotes Ralph Waldo Emerson as saying, "A man can only extend his attention to a certain finite amount of claims." (p. 235) Later, he refers to Garrison as one of "the faithful men of one idea." (p. 301)But what an idea! The idea was of course that chattel slavery was wrong and the only correct action was an immediate end to it.So perhaps the challenge for me is not what to read next, but maybe what to do or write next? a great book about a great, great man, utterly admirable, an example for us all. A long book that reminds us how many years it took for activists to make abolition of slavery possible. What endurance! This fierce public advocate for equal rights was a sweet and loving husband and father at home - look for the photograph of Garrison and his daughter Fanny, very unusual in 19th c. photographs for its playful affection. Wonderful book! I loved this masterful biography of Garrison.Good to see the great aboltionist get his due. The author,who btw,is from the SaN FranciscoBay area. He stated that Lincoln and Garrison were the 2 greatestAmericans of the 19th century.After reading this book I agree! PS Garrison put into action nonviolent protest 50 years beforeGhandi. Garrison dedicated his life to bringing about reform by forcing the American people to confront ethical dilemmas, primarily but not exclusively slavery, while shunning 'high' politics. After reading this book, I want to reread the Socratic dialogues with the benefit of the Garrisonian perspective. Truly fascinating, both as a followup to reading "Days of Defiance" and to me as a Bostonian. It helped cement which type of crazy fanatics I like, even if this may be Mayer's illusion of a Garrison. Information overload. I couldn't finish it. It's impossible to overstate Garrison's impact on American politics and culture. This book is a carefully researched, highly detailed of his life and his journey in abolition. Great author ! Great fighter for human freedom ! May have been a zealot but a passionate and clear voice in a time of need.